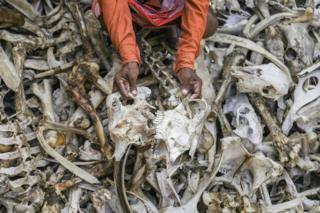 “Bone collectors” in the northern Indian state of Uttar Pradesh have been collecting the bones from animal carcasses for generations. But they have been living in fear since the government’s crackdown on cattle slaughter in 2017. Photographer Ankit Srinivas spoke to some of them. 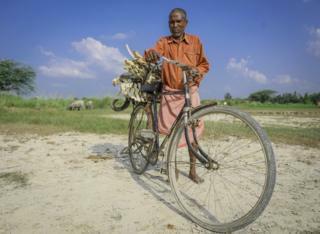 “When people see us carrying bones, they just assume that we work for slaughterhouses,” says 55-year-old Brijwasi Lal. 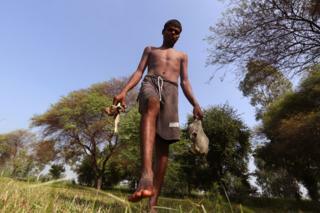 Mr Lal is among thousands of Dalits (formerly known as Untouchables) who make a living from selling the bones. Over the past year, several of them have said they were attacked on the suspicion of smuggling cows for slaughter. Mr Lal too says he has been threatened a few times. 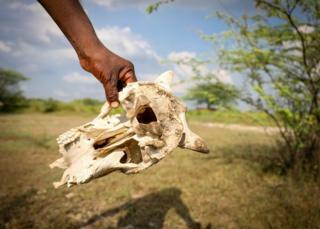 Is India’s ban on cattle slaughter ‘food fascism’? Authorities in Uttar Pradesh closed many slaughterhouses after the Hindu nationalist Bharatiya Janata Party (BJP) won the state elections in March 2017. Slaughtering cattle is already banned in some 18 states, but many of them actively started enforcing the ban after the BJP formed India’s federal government in 2014. The party believes that cows should be protected as they are considered holy by India’s majority Hindu population. But millions of Indians – including Dalits, Muslims and Christians – consume beef. It’s unclear exactly how many Dalits in Uttar Pradesh work as bone collectors but they are mostly located around the cities of Allahabad, Kanpur and Gonda – close to the factories that buy the bones and crush them into powder, which is then used for processing various chemicals. But Mr Lal says he is scared now because about a dozen people have been killed in the last few years in the name of protecting cows. Most of the victims were Muslims – and they were often targeted on the basis of rumours. “We have to be very careful and that is why we start very early in the dark and finish our work before 10am,” says Mr Lal. He adds that the job is especially difficult because of the stigma associated with it. Despite laws to protect them, discrimination remains a daily reality for India’s 200 million Dalits. Sugreev, who does not wish to reveal his last name, says the work requires a lot of physical and mental strength. 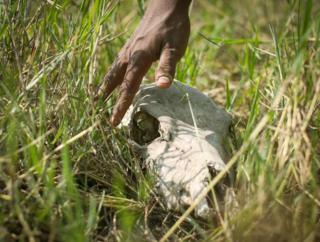 He hopes his children, who have also started collecting bones, will eventually be able to find other work. Baisakhu, who also goes only by his first name, agrees as he dumps the day’s collection onto a big, stinking heap of bones. He is also worried about the attacks on Muslims and Dalits by cow vigilante groups. “We don’t kill animals,” he says. “We only pick their bones when they die. But some people are ignorant and end up abusing us. 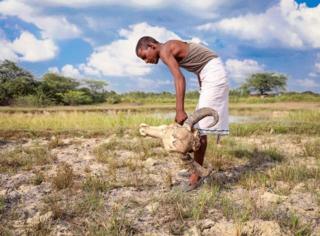 The work, he adds, is gruelling – they walk for hours looking for carcasses from which they can pick bones. Once they find them, they either carry them back on their shoulders or transport them on their cycles. 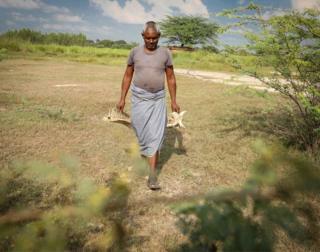 Sometimes, they get injured but cannot afford to go to a hospital because their income is meagre and sporadic. He often borrows money to feed his family of five. He adds that the threat of violence has only made his life harder. A few months ago, he says, he was on his way home after a “morning round of bone collecting” when he was stopped by a group of men. Why are India’s Dalit students taking their lives? Chotu, who goes only by his first name, is among the few who has left the profession. Now, he works as domestic help. But occasionally, when he needs the extra money, he also collects bones. But he hopes he can completely stop doing this soon. “What is the point of doing a job that people don’t understand? We are cleaning the environment but all we get in return is insult and threats. Ankit Srinivas is a freelance photographer based in Allahabad.